The day started off rainy and chilly, so the obligatory fire was warming the hearth. Our only goal set for the day was a venture into Bigelow Hollow State Park located in Union, Connecticut. 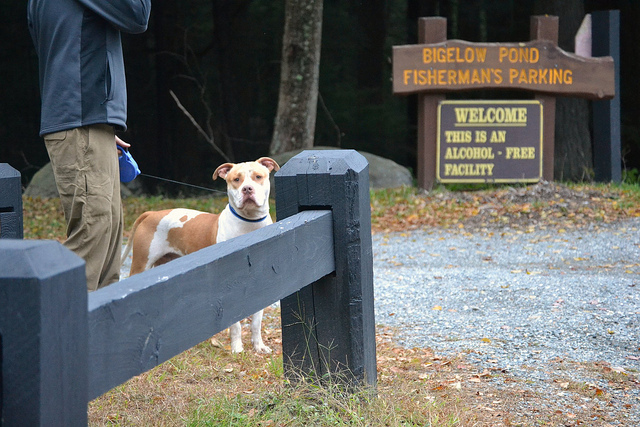 Combined with the Nipmuck State Forest, Bigelow Hollow is a beautiful park with plenty of forest and water formations to enjoy. 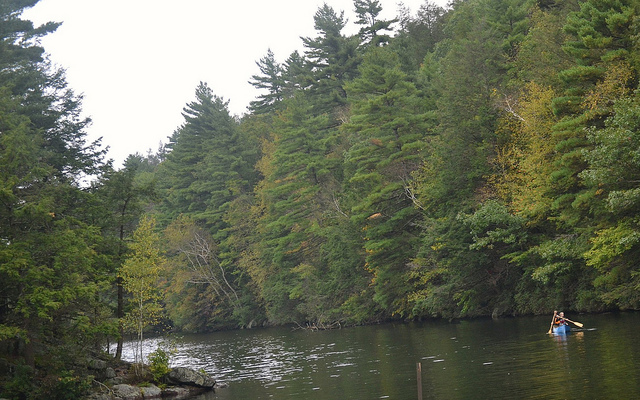 Hiking, fishing, boating, and picnicking with plenty of parking are all available. There is a fee in season, but not now during arguably the best time to be hiking. The day was cool and cloudy, but comfortable with shots of sunshine. Another plus was the noticeable absence of mosquitoes. We parked at the main boat launch at Mashapaug Lake to enjoy a quick lunch while watching the unique collection of people meander through, from a forgotten 80's rocker to an elderly Rastafarian-ish fisherman and his toddler grandson. The view from the parking lot and boat launch was postcard, and the fresh smell of forest was in the air. 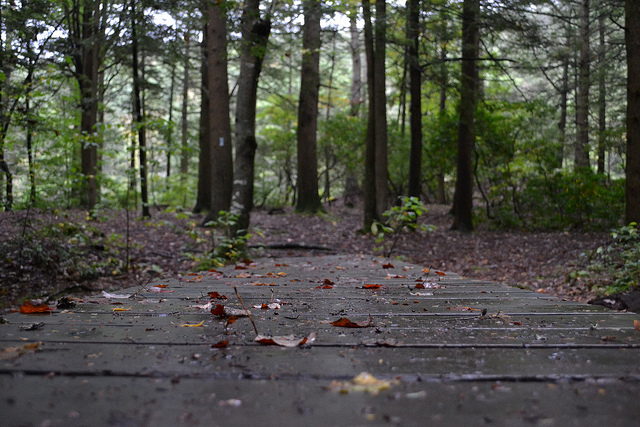 There are long trails throughout the park/forest for great day hiking trips, but a few were difficult to locate. We don't mind exploring a bit so we chose a trail head with no cars around and headed off. It became evident why no cars were parked in this area. After two hundred yards or so, a small beaver dam had allowed substantial flooding over the trail. 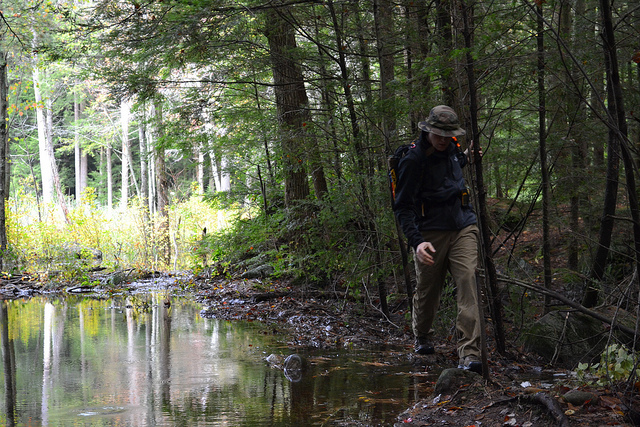 Normally we would wade through, but it was early in the hike and we still had the canoe trip in mind. A brief reconnaissance around the flooded area proved fruitless, so we headed back to the boat launch to hike on one of the popular trails. The main trail was easy to hike and well maintained. 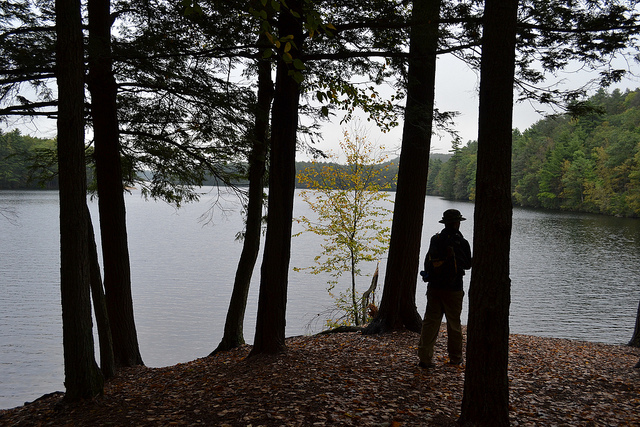 It followed the curving shore of Mashapaug Lake to an impressive picnic area with tables and fire pits. I imagine the place is very busy in season, but for now it was deserted. Sadly, the litter was dominant, a disturbing theme that seems increasingly common. I stuffed wads of fishing line in my pockets and gathered up broken glass, but there was too much for me to handle. Unfortunate to say the least, because the view across the lake is surprisingly grand, but who wants to sit in a landfill to enjoy it? The forest trail stayed close to the lake with excellent signage and bridges over mucky areas. Again the litter really detracted from the beauty of the place. Honestly, if you are going to litter, at least drop it on the trail instead of throwing into the brush so others can pick it up with ease. We arrived at another picnic area comprised of a giant rock face rising from the water - the perfect place to sit and reflect. I watched a fisherman cruise the far shore, casting his line with no result. I will wager that he felt silently floating on a placid lake catching nothing is still the best fishing anywhere. 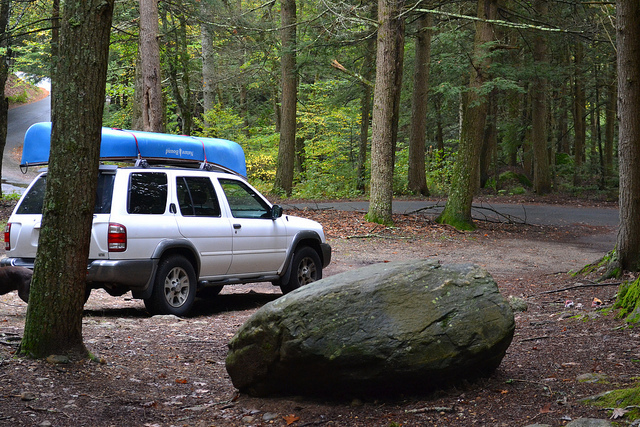 After a quick wade in the water, we hiked back to the parking lot and unloaded the canoe. The dog joined us for the hike (her pathetic look while waiting by the front door led to me being outvoted), though we thought it was better if she remained on shore, Heather stayed behind with her. Emily and I quickly set off for an easy float. Have I mentioned how much I love that canoe? We coasted silently along the shore, searching for anything of interest - small fish, snapping turtles, sunken ships and the like. 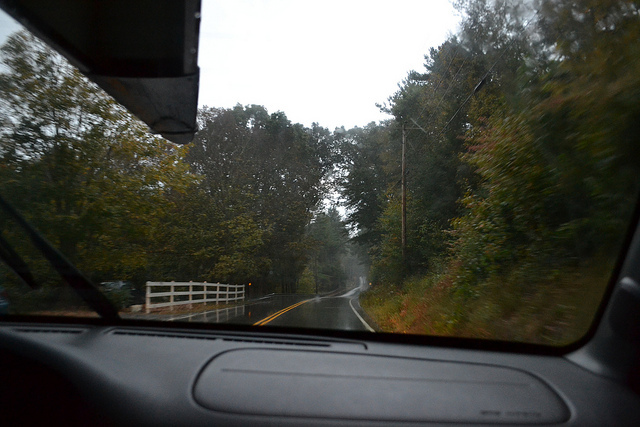 We paddled hard and fast only to have Emily hit the brakes, turning us in a sharp arc much to my feigned chagrin. We drifted, experimented with the current, made navigational mistakes and executed incredible evasive maneuvers. We discussed the effects of lightning on our small craft, and more importantly ourselves. We were out for only forty minutes or so, but what a ride. It was late afternoon when we loaded up and left. We spotted a wandering dog on our way out. No collar and seemingly lost, we stopped and watched it while discussing whether to leave it be or not. The dog was neatly groomed, well fed, and predictable. It was decided that the dog had to be dealt with (outvoted again) and I whistled. 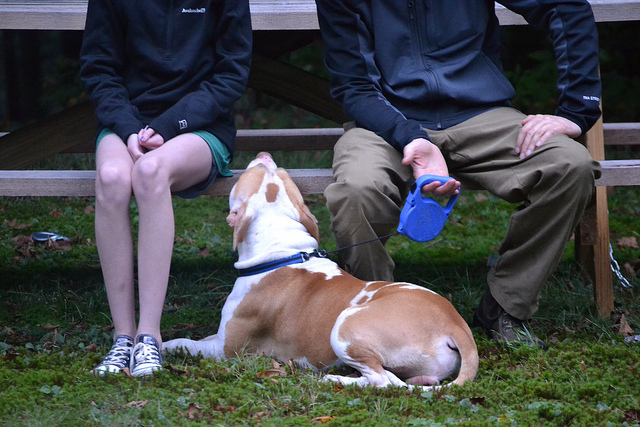 The dog came right over and enthusiastically introduced himself. 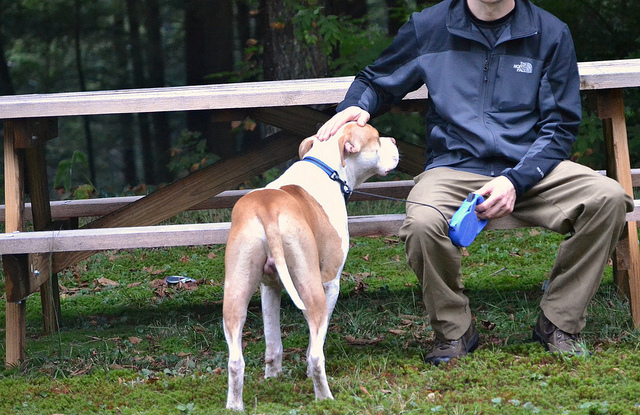 Using a spare leash, I led this mild-mannered canine off the road and called the local warden. Sadly, the warden informed us that this looked like a dump and run situation. Unbelievable. We ended the day with some of the best ice cream in the Northeast. In warm, freshly made waffle cones no less. 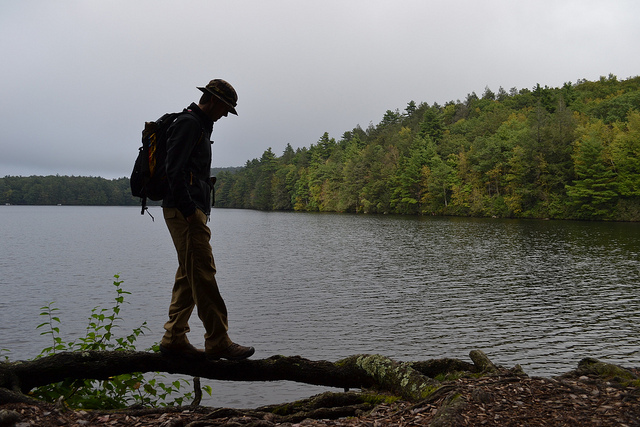 It is October in New England, and the outdoors beckons. Do you have an autumn hike or activity that is a favorite in your area?